It may be the middle of winter but don’t let the cold, wet weather cause you to hunker down and stay indoors. 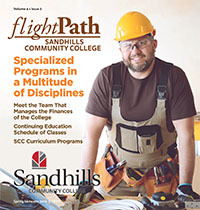 Branch out and come to Sandhills Community College to challenge yourself with a new hobby or skill, deepen your understanding of a particular topic or even learn new culinary tips and tricks. The Center for Creative Living can help you achieve a more rewarding life. You can also make new friends, ask a current friend to join you, or reconnect with former classmates. Interspersed in “Heritage Art Production: Intro to Ceramics” will be a discussion on the history and trends of heritage art. Receive valuable information to outfit an appropriate studio. Learn hands-on this artist who has perfected her technique all while providing valuable insight into her art. Supplies needed: pin tool, cutting wire, wooden paddle, rubber rib, serrated metal rib & fettling knife. Clay is provided. “Heritage Art Production: Intro to Ceramics” will be held on Mondays and Wednesdays, Feb. 4-March 27 from 6-8 p.m. The cost is $130. “Beekeeping for Beginners” is perfect for those curious about beehives or the irreplaceable value of honey bees in our food system. Build your foundation as a beginner beekeeper. You will learn Beekeeping equipment, the biology of the honeybee, how to treat and deal with bee stings, what to do when a swarm occurs, general management of beehives, how to extract honey, and how to identify and treat bee diseases. “Beekeeping for Beginners” will be held on Thursdays, Feb. 7-March 28 from 6:30-8:30 p.m. The cost is $75 plus the cost of the text. Whether you need set design skills for church plays, school plays, or community venues, “Create the Stage” is the course for you. Learn the basics of the tools you will need to create the desired experience. When combined with your artistic ability you will transform your imagination into a magical place for theatrical experiences. “Create the Stage” will be held on Tuesdays and Thursdays, Feb. 5-March 14 from 6-8 p.m. The cost is $75. In “Get Moving to Latin and Ballroom Dancing!,” professional dance instructor, Debby Hasson, introduces you to the Tango, Cha-Cha & Rumba. Learn the simple way to dance the Swing, Tango, Foxtrot, Cha Cha, Waltz, and Rumba. With over 30 years’ experience teaching dancers of all levels, Debby introduces you to the most popular social dances of today. Dancing partner not required. “Get Moving to Latin and Ballroom Dancing!” will be held on Wednesdays, Feb. 20-March 27 from 6-7 p.m. The cost is $65. Learn the basics and some fun dance moves to the Salsa and Bachata in “Salsa Dance Class.” With over 30 years of teaching experience, Debby Hasson will introduce you to the fun and exciting world of salsa dancing. No partner necessary. “Salsa Dance Class” will be held Wednesdays, Feb. 20-March 27 from 7:15-8:15 p.m. The cost is $65. Like Einstein, filmmakers have long recognized the “fluid” nature of time in storytelling. Join us for “It’s About Time – Films that Test the Limits of the Clock” as we explore how cinema unleashes heroes and heroines from the constraints of time as they journey hither and yon across time and space. “It’s About Time – Films that Test the Limits of the Clock” will be held on Tuesdays, Feb. 5-26, from 2-4:30 p.m. The cost is $45. “The Sultanate of Oman: Switzerland of the Middle East” introduces students to the history of Oman and their relations with the US and the region. The US and Oman have the oldest diplomatic relationship in the Persian Gulf Region and 30% of the world’s oil transits Omani controlled waters. Topics include political, social, and security topics and Oman’s unique diplomatic position in the region. “The Sultanate of Oman: Switzerland of the Middle East” will be held on Tuesdays, Feb. 5-26 from 2-4 p.m. The cost is $45. “The American Civil War: the Peninsula Campaign of 1862” will be held on Thursdays, Feb. 7-28 from 1-3 p.m. The cost is $25. Propose a topic, develop well-rounded perspectives and appreciations, and learn to agree to disagree in a civil, well-intended manner in “Civility in Public Discourse: Political or Otherwise.” Peter Holmes will lead discussion and engagement in this thought-provoking class allowing you to learn from each other on the topic at hand, and as a result, come to an understanding–not an agreement necessarily, but learn to reach a civil disagreement. “It’s what we need in today’s society,” says Holmes. Peter Holmes spent his 38-year professional career in Washington DC serving in a variety of positions including Director of the Department of Health, Education and Welfare from 1973 to 1975 making him responsible for the Title VI anti-discrimination laws with respect to federally-assisted health, welfare, elementary, secondary and higher education institutions. “Civility in Public Discourse: Political or Otherwise” will be held on Tuesdays and Thursdays, Feb. 26-March 31 from 10 a.m.-Noon. The cost is $50. America the “melting pot” entices the lifelong learner whether you want to speak Italian for business, travel or personal enrichment. Learn la bella lingua. Learn to use basic vocabulary and expressions used in everyday situations. In “Italian Beginning Conversation” students read a variety of basic written materials and learn to write simple sentences needed in everyday life. “Italian Beginning Conversation” will be held on Mondays and Wednesdays, Feb. 4-March 13 from 6-8 p.m. The cost is $75 plus the cost of the text. Join this lively and animated Spanish instructor to learn “Spanish Beginning Conversation” for work or pleasure while also learning about the Spanish culture. Instructor Saulsbury is a native of Madrid, Spain and studied languages at the Berlitz School. “Spanish Beginning Conversation” will be held on Mondays and Wednesdays, Feb. 4-March 13 from 6-8 p.m. The cost is $75 plus the cost of the text. Learn to make authentic “Risotto” from scratch. You will learn the basics as well as how to use different flavors. We will make a mushroom and pea risotto. “Risotto” will be held on Tuesday, Feb. 5 from 4:30-7:30 p.m. The cost is $75. Looking for that special way to say “I Love You” on Valentine’s Day? Make your own delicious chocolates and say it your way in “Molded and Filled Chocolates!” In just a few hours with Chef Monica Midgette you will learn how to mold, fill, and decorate your own chocolates. “Molded and Filled Chocolates” will be held on Wednesday, Feb. 6 from 9 a.m.-1 p.m. The cost is $75. “Knife Skills 101 & Sushi Rolling” will be held on Wednesday, Feb. 6 from 5-8 p.m. Another class will be offered on Friday, Feb. 8 from 9:30 a.m.-Noon. The cost is $75. Discover how to create soups from scratch in “Soups.” We have options for meat and veggie soup a with a new spin on steak, ale, and cheddar and a summer vegetable minestrone. “Soups” will be held on Tuesday, Feb. 21 from 4:30-7:30 p.m. The cost is $75. Finding it hard to cook healthy for just a few? Is it a challenge to prepare mouth-watering choices that are appetizing AND healthy? Chef Monica Midgette will guide you through the process of making healthy meals for two in “Healthy Cooking for Two.” You’ll get hands on experience making a meal and take home a packet of wonderful recipes to try. “Healthy Cooking for Two” will be held on Wednesday, Feb. 13 from 10 a.m.-1 p.m. The cost is $75. “Make Your Own Seasoning Blends.”” will be held on Wednesday, Feb. 13 from 5-7 p.m. Another class will be offered on Friday, Feb. 15 from 9:30-11:30 a.m. The cost is $75. Learn how to make traditional challah bread in “Challah Breads.” Today we will make traditional and cinnamon raisin challah. “Challah Breads” will be held on Tuesday, Feb. 19 from 4:30-7:30 p.m. The cost is $75. Making pasta from scratch is easier than you think. It is and it’s fun too. “Stuffed Pasta Workshop” is a hands-on class where we will turn flour and egg into sheets of pasta ready to be stuffed for delicious ravioli, tortellini, and cappelletti. Great make ahead item for meal prep. “Stuffed Pasta Workshop” will be held on Wednesday, Feb. 20 from 5-8 p.m. Another class will be offered on Friday, Feb. 22 from 9:30 a.m.-12:30 p.m. The cost is $75. Find the thought of making your own bread daunting? Forget reaching for those frozen rolls at the supermarket. In “Quick Breads” learn how easy it is to make your own rolls and bread with Chef Monica Midgette. Learn how to make your own. We will make drop biscuits, muffins, and loaf breads. “Quick Breads” will be held on Wednesday, Feb. 27 from 9 a.m.-1 p.m. The cost is $75. Why look for dinner in the grocery store freezer section? Stock your own freezer with homemade meals. In “Meal Prep” learn how to make Chicken Pot Pie, Shepard’s Pie and Lasagna; time-saving and family-pleasing. “Meal Prep” will be held on Wednesday, Feb. 27 from 5-8 p.m. The cost is $75. Let us make vegetarian dishes fun! In “Vegetarian” we will cook fajitas with lime cilantro rice vegetarian fajitas with Portobello mushroom as the protein replacement as well as a hearty vegetarian wellington. “Meal Prep” will be held on Thursday, Feb. 28 from 4:30 p.m.-7:30 p.m. The cost is $75.